This unit focuses on population momentum, the notion that for most of the world the population would continue to grow even if fertility dropped suddenly to replacement levels. We see that the net reproduction ratio is 1.703 daughters per woman. The population of Western Asia was growing fast at the turn of the century. What would have happened if fertility had dropped instantly to replacement level? One way to answer the question would be to adjust the maternity function and do the projection. Here we will consider the alternatives. We first need to estimate the replacement-level maternity function, which we do by simply dividing the observed rates by the NRR. (Note that there are many other maternity functions that would work just as well, we follow tradition in assuming a proportionate decline.) We also need the mean age of the new maternity schedule. These values are 5 times those published in the textbook, the reason will be revealed at the end of this section. And we discover that the female population will grow another 61.0%, even if rates dropped immediately to replacement level. A similar calculation with the male population and life table and the same weights shows that the male population would grow another 50.4%. The weighted average of these numbers is 56%. 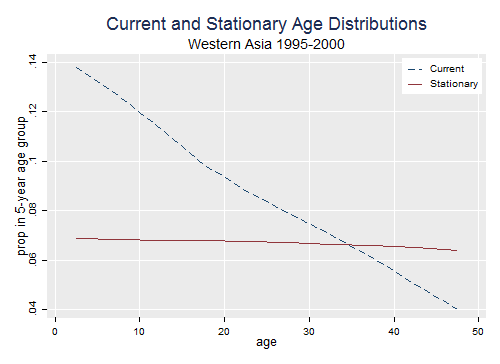 Finally we plot the current and stationary age distributions. The reason for the substantial momentum should be clear from the nature of the age distributions. Now for the missing multiplier. The textbook doesn't multiply by 5 in computing the weights, but divides the nLx's by 5, which produces the same end result. However, as explained on page 162, all three ingredients are distributions that sum to one. Mine do, whereas the weights in the text sum to 0.2, and does the implied stationary age distribution. These, of course, appear in the numerator and denominator of equation 7.21, so the factor of five cancels. To plot the age distributions, however, one needs to use nLx/e0, not (nLx/5)/e0. The idea of population momentum originated with Keyfitz, and proved quite influential in policy circles. His formulation assumed that the population was stable at the outset and the reduction in rates was proportionally the same at all ages, but neither assumption is required in the previous development. Because the method is still popular, however, we apply it to Western Asia. In the original 1971 paper, momentum is given by b e0(R-1)/(R r m), but the expression in common use is Frauhental's approximation b e0/√R where R is the NRR. So momentum is directly proportional to the birth rate and the expectation of life and inversely proportional to the square root of the net reproduction ratio. We obtain a momentum of 1.57, which is not far from the more exact 1.61 computed above. Not bad for a simple calculation.